School is back in full swing which means so are soccer practices, piano lessons, homework, and busy schedules. Amidst those busy schedules, it seems our lives revolve around food. I spend my mornings trying to get my kids to eat a healthy breakfast. I pack their lunches and a snack. As soon as they walk in from school, they raid the pantry and, pretty soon after that, they start asking the inevitable,"What are we having for dinner?" All the meal planning is so frustrating and tiring sometimes. I don't have the energy to be creative with it, os I just stick to the same old basics - spaghetti, tacos, chicken, and more chicken. 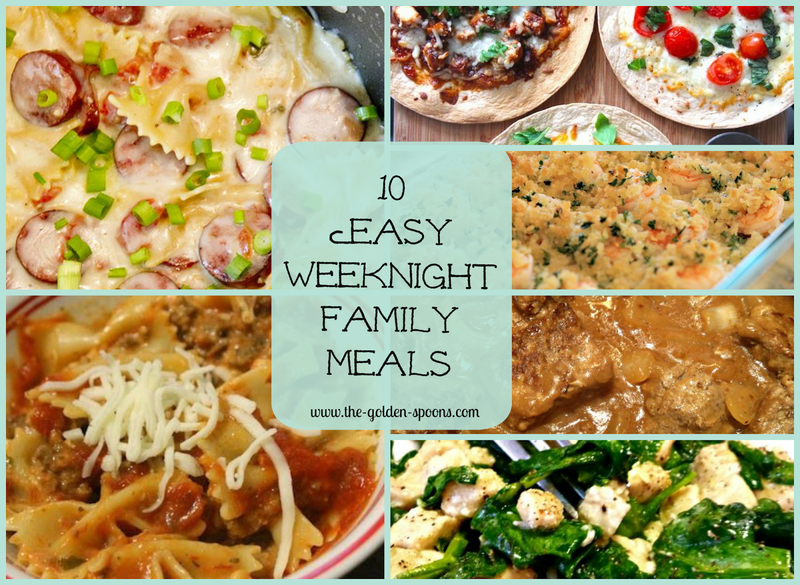 I desperately needed some new ideas to jazz up our family menu, so I went to Pinterest looking for some easy weeknight meal ideas. I found several that look super scrumptious and I wanted to share them with all of you, too! This One Pot Cheesy Smoked Sausage and Pasta Skillet meal from Yellow Bliss Road is actually on my menu for this week! I can't wait to see how it turns out. For a slight different twist on a pasta, I pinned this Spicy Chicken Rigatoni Recipe from Six Sisters. This Skillet Lasagna from Fatastical Sharing of Recipes is more traditional, but a whole lot easier and quicker than regular lasagna. I've been trying to eat healthier and this Garlic Parmesan Chicken from Simply Healthy Home looks delicious! I'm sure my kids will turn their noses up at the spinach, but I'm going to try it anyway! Of course, if I make too much chicken my husband says he is going to start clucking (which would actually be kind of funny! ), so to change things up a little, I pinned this recipe for Pan Seared Pork Chops with Dijon Butter Sauce from Rock Recipes. Instead of tacos, I plan to try this Chicken Enchilada Skillet from Add A Pinch when I'm in the mood for a little Mexican flare for dinner. Perhaps I can do a little Mexican/Italian Combo with these Tortilla Pizzas from Food and the City. These would be great to make with the kids one night since they are completely customizable! I don't do a lot of seafood, but if I did, I would definitely try this Garlicky Baked Shrimp from Normal Cooking. It looks fabulous and, I imagine that, tossed with a little pasta, my seafood aversion might be diminished significantly. Finally, there is nothing quite like a good ole' burger. For a healthier, tasty twist, these Buffalo Turkey Burgers from Sarcastic Cooking look incredible. I might have to back off on the heat for the kiddos, but still - Yum!!! How about you? What's on your dinner menu? Think you might try any of these??? Hope they turn out to be great! These look fabulous Lisa!! Definitely pinned and will try many of them! Hope you like them & thanks for pinning! Love this post! All of these are great... and I especially like number 16. I always tell my kids to bring me three possible solutions with every problem they want to talk about. It's an important life skill. So beautiful! I love 17 & 19! So important! I love the expression "common sense is not that common." So true. I also love your points - all of them. Having faith in fellow humans can be hard at times, especially when they are being ignorant @$$holes, but really, that's about them and not us, which also goes to #17 surrounding ourselves with good people. I feel like I surrounded myself with people who would just like me when I was younger and they weren't always very good people. Which goes to your self confidence one and being brave one and if you like sports play sports one... and all of them. xo Lisa. #10. Love that one. I think I try so hard not to do this now, but it's something that is so hard to tell kids! They want to grow up so fast. Such a great list. your girls are lucky to have you for a mom! Yes - don't just whine. Offer a way to help. Tortilla Pizza! Sounds so yummy and easy. Have to try them! These are some yummy recipes! Must try making a few. I have made those and they are fun! soso so so yum. Pinned to my food board.